Back about twenty-five years ago we had the privilege of attending a lecture by Christo at Lafayette College, in Easton, Pennsylvania. Up to and including that point we had never seen any of his efforts in person, only slides projected or articles written about his work. Despite his thick accent, the artist was very articulate about his process, but what we came away with that day were two things: that his huge engineering feats were extremely collaborative (not only with his partner Jeanne-Claude, but also with governments, local authorities, teams of construction crews, riggers, groups of arts helpers and seamstresses); and that his drawings of the projects were not only exquisite but helped to fund the final installations. We were also struck with his seeming facility in maneuvering within systems, layers and layers of them, well beyond the scope of the typical individual artist controlling his tiny, self-absorbed world. Not all of his projects have been realized, and so many of them were negotiated over so many years that it is sometimes hard to imagine how he kept up his interest in them. There must be in Christo and Jeanne-Claude a tenacity beyond all reason. Thank goodness. 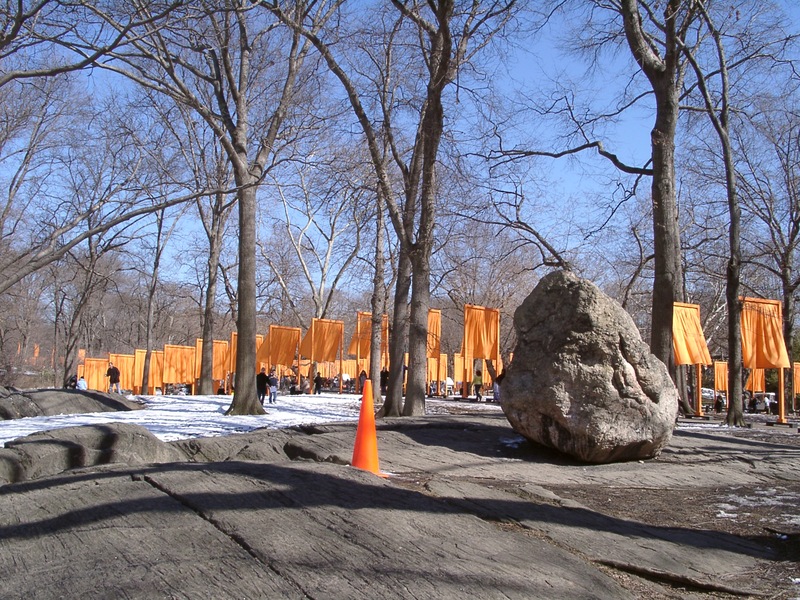 With the death of Jeanne-Claude just a few months ago, and with the five year anniversary of The Gates, Central Park, New York, 1979-2005, it is time to revisit the one installation by the famous team that we actually had the chance to see and experience. 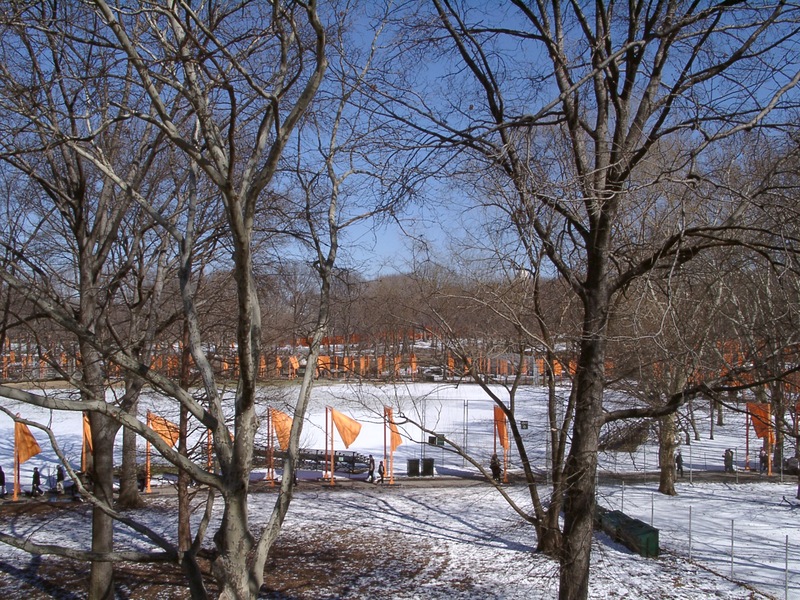 It was a cold day in February and the timing for an outdoor event in the park seemed odd. What we learned is that it was perfectly timed – for cheering up a dreary sort of mid-wintry day, for providing an environment of interaction and excitement – a work of public art that, oddly, both opened up a massive place to new ways of exploring it and, at the same time, functioned as a brilliant crowd-control device. Again, new ways of seeing what we had taken for granted and no longer saw, really. There was something so ceremonial, almost militaristic about the gates – rectangular arches, really – as they straddled the meandering paths, 23 miles of foot paths, weaving in and around the park, accompanied by the triumphal marching they induced in the spectators. (It was not a loopy thing to imagine oneself as a croquet ball rolling under hoops that flowed to the horizon.) 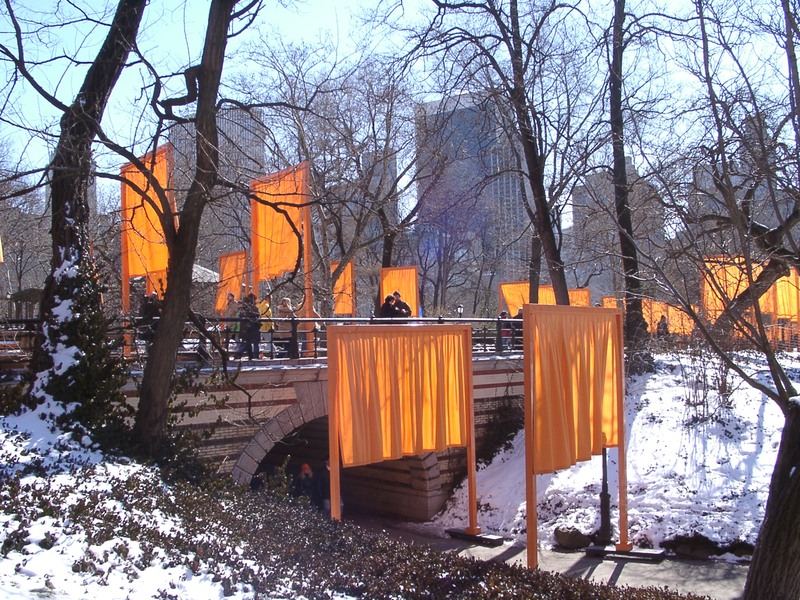 Also martial, too, was the emotional feel of the orange (saffron)-colored fabric suspended from the arches which, especially on a good windy day, flicked flag-like; and, yet, it was, more softly and resonantly, reminiscent of what happens when a warm gust blows curtains through a window on a summer’s breeze. The Gates: A manmade allee extending for miles and miles, providing both the comforting structural “posts” of tree trunks and the moving, ethereal canopy above. The sense of theatricality in walking under curtains, both into and out of, creating a kind of performance space between. A film strip of framed shutter exposures, capturing the landscape in quick succession. On such a sunny day as we had, the shadows created by the low sun bouncing off the trees were “painting” changing linear shapes onto the orange canvases. 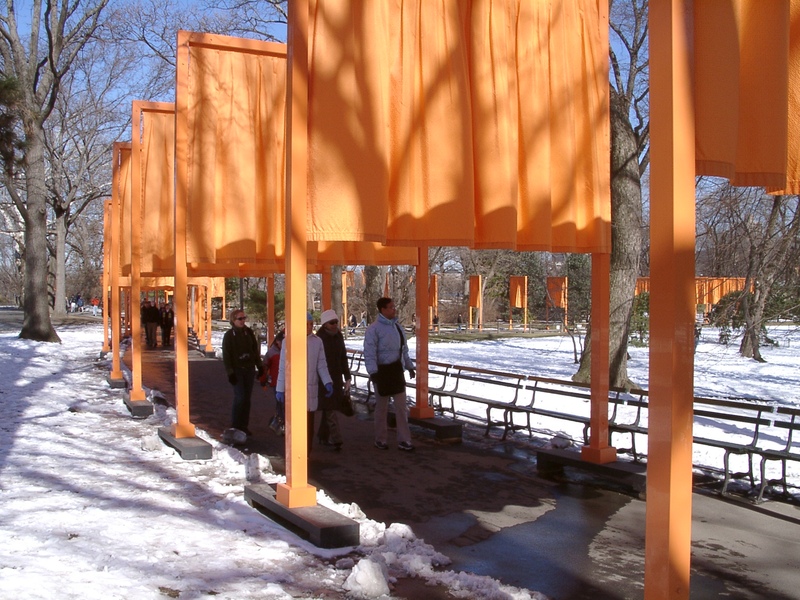 In retrospect, the gates resembled Jeanne-Claude with her tall thin build and her trademark orange hair – a sad reminder of her loss. What was both surprising and enlightening was the interplay that these installed, manufactured elements had with the landscape, a running stitch of orange thread. First, seeing them in perspective dotting the grounds gave such a different feel to the park, making it seem mapped rather than natural. And, of course, we know that Central Park is not natural, but our tricked eyes accept that it is. The effect was like having a virtual picture of the park and then, using an orange marker, outlining and emphasizing the topography, its plan and flow. The addition of these emphatic signposts made us “see” our world more vividly – the changes in grade, the shrinking perspective, the intersection and interplay of routes, the circuitous nature of the layout that creates a far vaster feeling parkland than really exists, and the views created and enhanced by the twists and turns, hills and dales. Despite the number and frequency of the gates, the park became more comprehensible, simultaneously more focused and more open. With no attempt to hide their artificiality, these huge, repetitive outlines seemed perfectly in place. In the unnatural environment that is New York City, within it the unnatural nature that is Central Park, and then the applied unnatural framework of gates; like nesting Russian dolls, all together had a perfect synchronicity of meaning and focused the mind’s eye, just as any good art can. It opened up a new world by framing it, and manifested an eye-opening placeness where a new one didn’t seem to be needed, but was. The Philadelphia Museum of Art and its grounds are a facsimile of the Acropolis of Athens: a flat-topped mini-mountain with temples sprouting forth. The museum building sits astride a rocky promontory named Faire Mount, once topped by an earthen-walled reservoir that held the city’s water supply; aptly called the “Parthenon on the Parkway,” the Greek-inspired structure and its site offer dramatic bird’s-eye views – one side looks down on the Champs-Elysees-style Benjamin Franklin Parkway, and from the opposite side, the flowing waters, elegant dam and sinuous valley of the Schuylkill. Over the past two years, in a project almost as massive an undertaking as the original 1815 reservoir, there has been an excavation of parts of the bluff for a parking facility and an accompanying designed reuse of the ground above, actually a green roof, for a sculpture garden. The opening for this welcome open-air addition was in September, but we explored it on a quieter day. First, it feels odd to be inhabiting space on the grounds (formerly a rock and grass cliff face) where you couldn’t go before – so, it is like visiting unknown territory surrounded by the familiar. The landscape plan, by Olin, utilizes the changes in grade to create terraces and garden rooms (but with views both in and out, above and below and, as we’ll see, through). The Museum itself calls this a “gallery without walls,” but many of the terraces do have walls, only they are glass. Despite the amount of plate glass a city-dweller passes by every day, not much of it is freestanding, so there is something strange about its presence in the landscape, generally, and its use as exterior fencing, specifically. However, the surreality aside, using glass as a frame and railing around the terrace edges has the dual ability of being not only a transparent, discrete and nondisruptive border but also a palpable design presence in the greater environment – there, and yet not there. 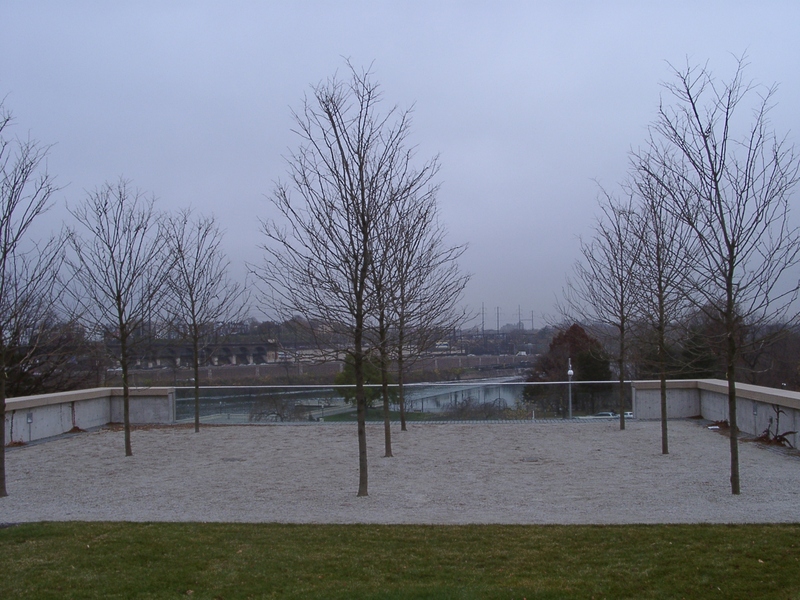 Of course, the plantings are new, so the “garden” part seems sparse and small in relation to the open space, which is magnified even more by the elevation of the site, creating a kind of natural pedestal for the artwork and for the viewer. The vistas out to the Schuylkill, its west bank rolling hills, the tree-lined parkway and its background of Fairmount Park, and the increasing density of high rises as the view heads east – all is hugely entertaining and encompassing. The question is: Can the sculpture garden compete in such a setting? The inaugural exhibition in the garden is of stone works by Isamu Noguchi, whose pieces are diverse enough to make one think that this might be a group show – except that the sensibility is familiar in all. 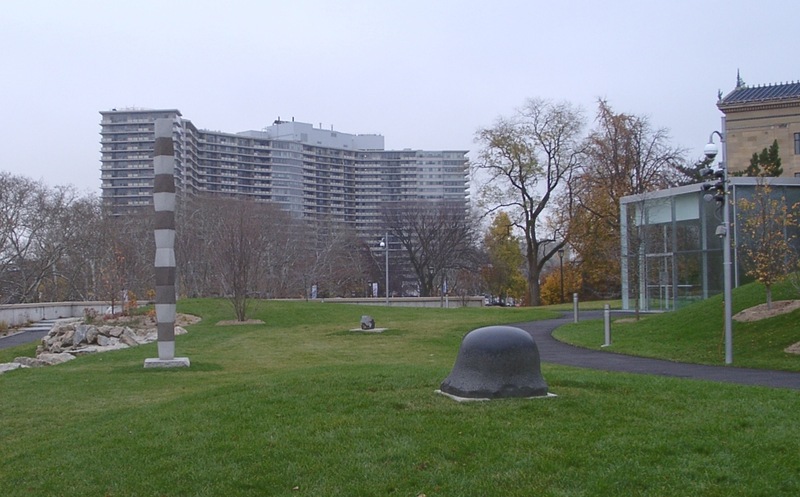 One particularly fortuitous pairing is of a Brancusi-like column standing against a backdrop of The Philadelphian apartments – both having a sameness in patterning and color, with their grey and white striping, the one undulating totemic form and the other massive edifice, in a stand-off conversation across the Parkway. 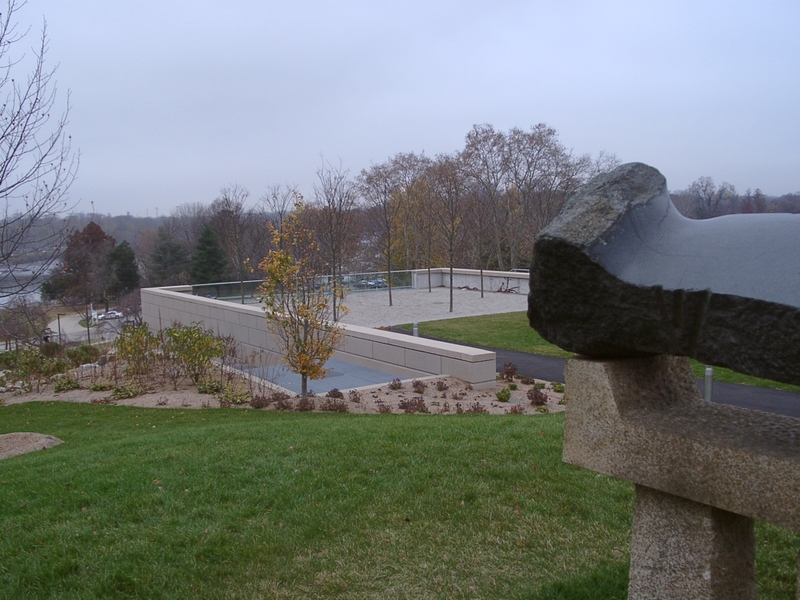 In answer to the question posed above – yes, the sculpture garden can compete. This is a bit of the Tuileries with a penthouse command, made up of contrasting colored gravel paths, green knolls, geometrically aligned trees and captivating captured scenic panoramas. Stylish in and of itself, it coexists with the surrounding beauty of the river as well as the nearby built environment, blending the two and mixing them up in an unfolding of defined spaces with both hard and soft edges and plenty of vantage points – for the garden rooms themselves, for the larger environment and for the sculptures that will inhabit the lofty perches created. In discussing “placeness,” we’ve been wondering: Can you have it if the thing you’re observing doesn’t exactly have “place”? What is it that’s there if there’s not really any there there? Art can be — and some great art is — ephemeral, but how about ethereal? And what is the difference, if any, between artistry and art, and what melds the two? We’ve been tossing around these concepts for a couple of weeks now, ever since New Year’s Eve, when we went to see Philadelphia’s fireworks display over the Delaware River at Penn’s Landing. It was an amazingly atmospheric night. There was a blue moon — the second full moon in one month — but you couldn’t tell. It had snowed lightly in the morning, leaving behind it not only the ground-masking white but also low clouds massed over the water and city like a flotilla of tethered blimps, moored to and obscuring the tops of the tallest buildings. A wet fog shape-shifted below. What this weather pattern did was to alter the usual shocking beauty of fireworks so that they became some other thing: their bursting colors and booming sounds were both muted and contained and veiled, and we among the huge crowd saw and heard them as if they were going off inside a tent, lighting it from within. Each missile’s light was magnified and refracted by the pendent fluff. Sometimes a launched firecracker would shoot up and keep on going beyond the cloud ceiling, bursting somewhere in that obscuring nest, backlighting the sky — and, occasionally, acting as a colored scrim for other smaller, bursting crackers in front and behind it, their spent paths like the squiggles you see when you have your eyes closed, or like the diaphanous folds and flow of the Northern Lights — then coming into bright view as it fell from the cloud back to our world. Shows within shows. With each launch and burst, something was created, if only for a minute, the way some subatomic particles exist merely in the tracing of a millisecond. The art was the place was the moment, then it was gone, unduplicatable, alive only in memory, leaving no mark in the sky yet carving an indelible one, defining art and space, the symbiotic relationship of plan and chance, and memory as entity. And arslocii. You could say that art is all around, waiting to be noticed. But, too, there are intentional sites, places of real vision and transcendence, where the meaningful placement of architecture, art and/or designed landscape in their environment results in a singular and wholly formed work whose parts are inseparable, producing a heightened creative unity — in other words, a “placeness.” These intentional sites — “arslocii” — have a special pairing of the manmade with nature, or sometimes even manmade with manmade; the effect being a symbiosis in which neither one stands out or alone, nor would be as meaningful, beautiful or inevitable without the other. It’s an interdependence of aesthetics that goes beyond, thankfully, human dominance over nature or setting, because that has never had much grace. Probasco Haus Press has set itself a challenge and a mission: to discover these sites, explore the meaningful convergences and engage with the spiritual aspects of the merger – a primal connection, a visceral understanding. Then, we will write here about our discoveries, as a way of figuring out how these pairings complement and enhance each other, becoming something greater.